/> For a number of years, considerable attention has come to focus on the children of Johann Sebastian Bach, but more recently, the light has begun to shine on some of his other relatives, specifically his cousin, Johann Ludwig Bach (1677–1731). Like many of Sebastian's other kin, Ludwig has largely remained in the shadows, something that may have pleased him, for as Carl Philipp Emanuel Bach wrote, “It would be impossible to understand why such good men are so little known beyond their fatherland and their situation that they did not want to venture far beyond same to seek their fortune elsewhere.” Later on, C. P. E. Bach observes, “They were happy to settle for the applause they were sure to receive from the rulers in whose territories they had been born and from their many ingenuous compatriots rather than to risk the uncertainty and difficulties involved in winning accolades from fewer and perhaps envious foreigners.” But to a degree, this anonymity has begun to dissipate. 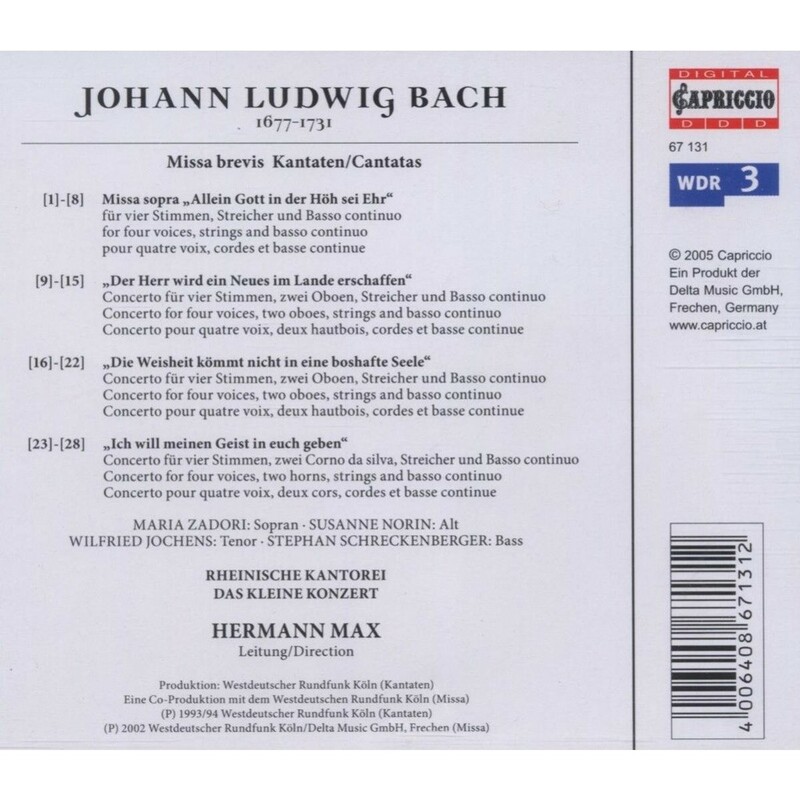 A number of years ago, Capriccio released a compact disc of motets (10 560) and another of funeral music (10 814), and Carus has three discs of Ludwig's choral works in its catalog: two CDs of the motets (83.186 and 83.187) and another disc that holds four cantatas, none of which duplicate the repertoire on this Capriccio release. Very little of what was Ludwig's apparently extensive œuvre has survived. With regard to his sacred compositions, we have just under two dozen cantatas, a dozen or so motets, and one mass. This is repertoire that is tailor-made for Herrmann Max, Das Kleine Konzert, and the Rheinische Kantorei. Soloists and choir are light-toned, agile, and communicative. They generate focused and appropriate emotion and shape and color their melodic lines with enviable ease. The orchestra is also in fine form, playing with energy, conviction, and razor-sharp ensemble. Marcus Schleich and Jörg Schultess receive special kudos for their enviable execution of the taxing horn parts in Ich will meinen Geist in euch geben. This four-year-old release from Capriccio is musically and artistically without fault. 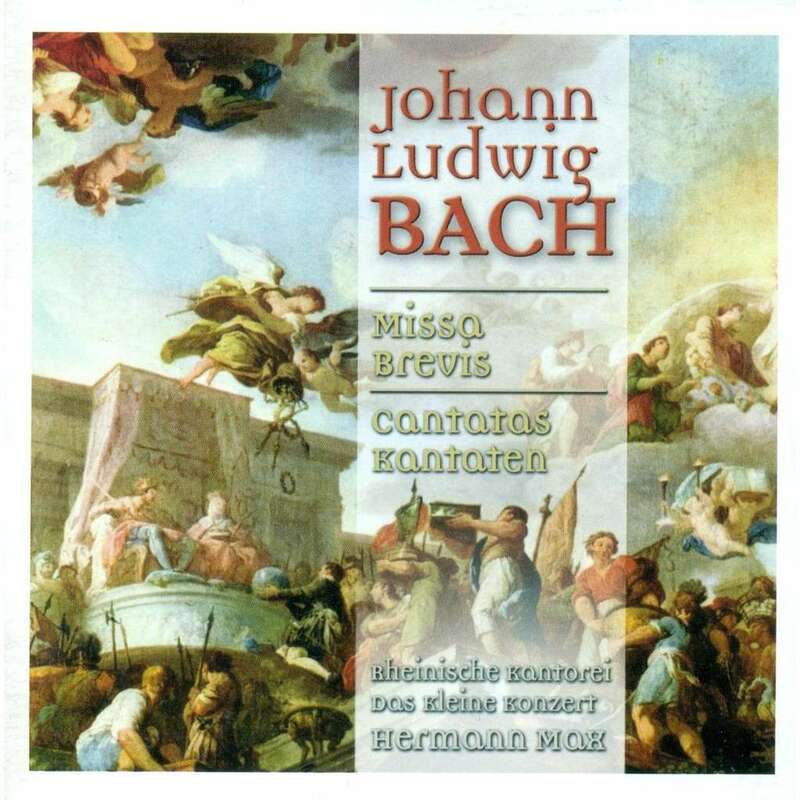 The curious will be pleasantly surprised and amply rewarded by this new inductee in our Hall of Fame; the Baroque fanatic, however, should acquire the Carus disc of cantatas as well.